General Hospital (GH) spoilers tease that Carly (Laura Wright) may have met her match. Dr. Kim Nero (Tamara Braun) was just introduced to viewers and she’s certainly feisty! 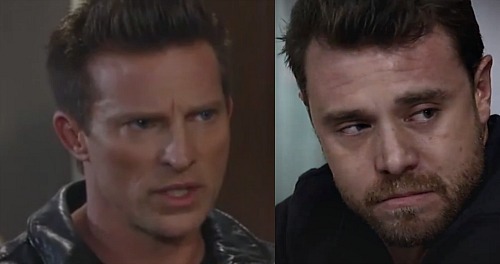 It’s clear that GH could get a nice rivalry out of this, especially since Patient Six (Steve Burton) is now stuck in the middle. Sonny (Maurice Benard), Robin (Kimberly McCullough), Michael (Chad Duell) and Carly are all convinced that Patient Six is Jason. Although his voice and personality have a lot to do with it, his face is also important. Current Jason’s changed mug puts him at a disadvantage in this storyline. If he were still identical to Patient Six, he’d undoubtedly have more people on his side. It’s easy for everybody to look at classic Jason and assume he’s the real one. That’s what the Jason they always knew looked like. However, Kim’s involvement will put an interesting spin on that situation. When she gazes in Patient Six’s eyes, she’ll see only Drew. Carly and Sonny will help P6 explain, but General Hospital spoilers say Kim will still marvel at his appearance. She feels a connection to him just like Carly and the others do. This could cause some serious conflict. Carly’s determined to get classic Jason’s life back on track, but she may fear that Kim will hinder that mission. She won’t want anything to jeopardize classic Jason’s future. Of course, there’s a great deal at stake for Kim. She may eventually want Patient Six in her life as well as Oscar’s (Garren Stitt). The only thing Kim and Carly may have in common is their rejection of the other twin. Poor current Jason just can’t get anyone on his side, even as Drew! Nevertheless, things will shift as more identity details come out. It seems Patient Six will be declared the real Jason Morgan on next week’s new episodes, November 27 – December 1, but will Kim believe the evidence? Regardless, Carly’s new enemy could give her a run for her money. They’re both sassy, ambitious women who aren’t afraid of a fight. General Hospital spoilers hint that trouble’s brewing, so stay tuned. What did you think of Tamara Braun’s debut as Kim? Do you like the character so far? Will Kim cause major problems for Carly and the whole classic Jason team? We’ll give you updates as other news comes in. Stick with ABC’s GH and don’t forget to check CDL often for the latest General Hospital spoilers, updates and news.